After more than 15 hours of deliberations the jury of 6 women in Sanford, FL has found George Zimmerman not guilty in the shooting death of Trayvon Martin. The jury had one question and sent the judge a note asking for clarification on the manslaughter charge this afternoon. That seemed to indicate they may have already passed on the more serious charge of second degree murder. Outside the courtroom and court house the crowds gathered all day, supporters of both sides waited all day in the heat. 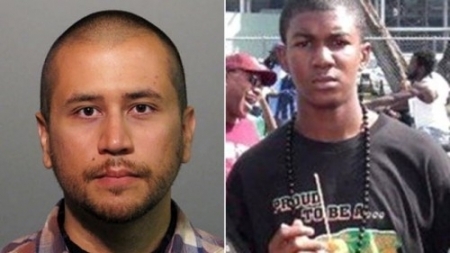 Zimmerman, 29, said he was acting in self-defense when he shot the unarmed Martin, 17, during an altercation in the gated community of Sanford, FL. Zimmerman was a neighborhood watch volunteer and was following Martin because he looked suspicious walking alone at night with a hood on February 26, 2012. Martin was going home from the convenience store. The case brought nationwide discussion of the “Stand Your Ground” law, guns, and race.